I don’t know about all of you, but I love listening to instrumentals by themselves sometimes. It keeps my ears happy and my mind focused. I’m not an emcee, but I’ll throw on an instrumental CD and just let it play for hours while I do my work. It gives me a beat to live by. Usually I’ll make my own compilation of instrumentals, but once in a while, we’re blessed with a full instrumental CD from a dope producer (one of my favourites is Dr. Dre – Chronic 2001 Instrumentals). 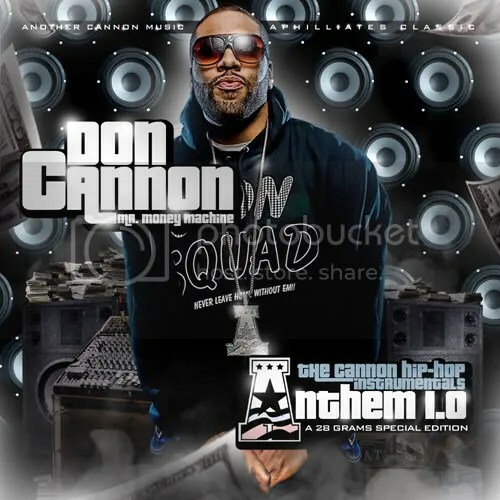 This time around, Aphilliates CEO/DJ/Producer, Don Cannon has dropped his own instrumental mixtape – Anthem 1.0: The Cannon Hip-Hop Instrumentals. I’m feelin this one. Cannon’s been bangin out some serious beats for a minute, so this is definitely a good look. *in my deep voice* CANNONNNNNN!